Diffraction Glasses are also called Prism Glasses, Rainbow, Firework, Rave, Light Show, Laser, Refraction, or EDM Glasses. They are all the same thing! beam of light is split into its individual spectrum of colors turning white light into a full rainbow spectrum. This is the main principle behind what gives diffraction glasses their awesome visual sensation. White light will show the widest array of colors, whereas looking at a blue light for example will show its component colors. 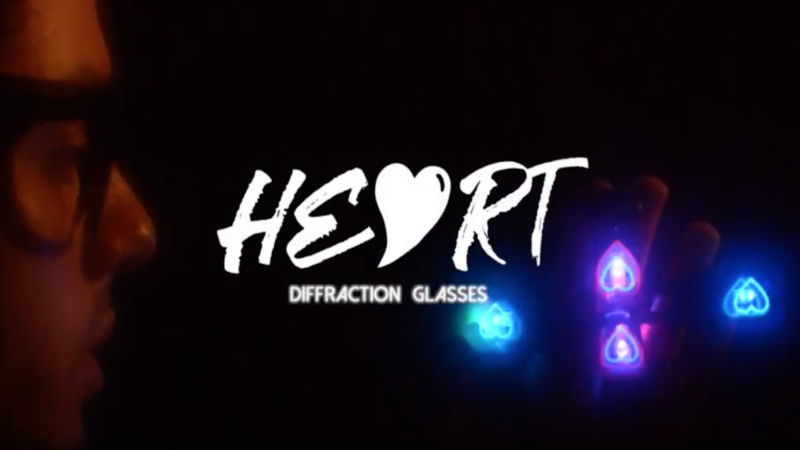 Check out what diffraction glasses really look like when viewing a single light source! As you can see, just looking at a single light source creates a burst of colors. Now imagine looking at hundreds of holiday lights, fireworks, or lasers, and you can see why diffraction glasses have really become so popular. The history of diffraction goes back far beyond over 300 years ago, when Sir Issac Newton observed a beam of sunlight pass through a glass prism. What he discovered is that light is made up of a spectrum ranging from 7 different visible colors. This is the exact same visible spectrum that you see when wearing diffraction glasses today! During this time a man by the name of Francesco Maria Grimaldi, also observed and characterized what would soon be known as light diffraction. Francesco is also known for coining the term “diffraction,” from the Latin “diffringere,” ‘to break into pieces.’ Fast forwarding through history, a scientist named James Gregory observed the first form of diffraction grating, by studying the light break up caused by bird feathers. Throughout the years, their observations were studied and molded into the theories and laws, which govern, light diffraction as we know it today. Diffraction, in physics, is the spreading out of waves, such as those of water, sound, radio, or light, as they pass around an obstacle or go through an opening. A couple everyday examples are water waves spreading out as they move around an obstacle such as a projecting rock in a stream. These waves have been diffracted. Another more familiar form happens when a light hits the back of your favorite CD, casting a rainbow of colors, or simply the hologram on your credit card is the result of light grating. Light waves ordinarily will not bend around corners, but they will be diffracted when they pass through tiny openings. This is the key to providing an awesome and stimulating visual experience. 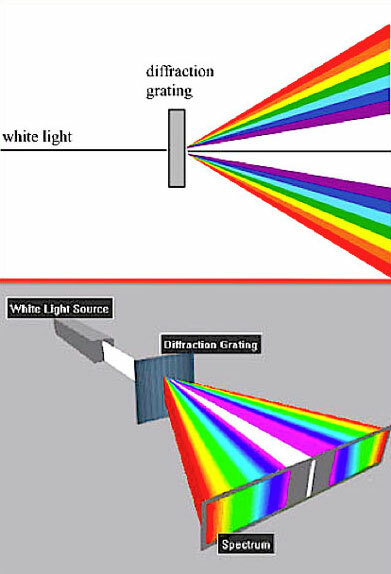 When light strikes a grating (in our glasses this is the lens) which is marked with thousands of parallel lines, the light waves are caused to spread in such a way that they produce a spectrum, or rainbow, as pictured above! Even tiny water droplets can act as a grating to create a 3D prism of light diffraction. Another cool fact about diffraction is that you can actually tell a plethora of different information based on the spectrum of colors it produces, when the light it emits, passes through a diffraction grating. For example, you can determine how hot the object is, how fast it’s moving, or what it’s made of. When looking at objects, such as distant stars, this kind of information can be very beneficial. Realistically though, you are most likely buying a pair of these glasses for entertainment purposes and could care less about the temperature of a star millions of light years away. So what makes the best diffraction glasses? Well, it depends what you are looking for out of your glasses. Some people enjoy a softer effect to wear during the day and for long-term use. Whereas most people look for the most intense effect created by multiple lasers of grating materials or multiple lenses. If you are looking for Rave Glasses, we recommend an intense effect as found with our 3D Diffraction Glasses, or Matrix Glasses. Some even prefer customizable diffraction glasses or custom printed. Do keep in mind, the more diffraction you have, the less white light passes through the lens creating a more blurry view. The best diffraction glasses at the end of the day are judged on a personal perspective. Luckily, GloFX offers hundreds of dimensional eyewear options. You’re bound to find a pair of EDM glasses or rainbow glasses that suites you. What’s The Difference Between All The Different Kinds? GloFX offers a vast array of styles and models of Diffraction Glasses. Choosing the right kind can be tough. So, we’ve organized our catalog into several section and sub-categories to help you navigate to the best pair for you. Each section will be based on a particular frame shape, function, or purpose. Standard: This is our most affordable style and features a single layer of rainbow light grating in a traditional plastic frame. Ultimate: This is our best selling model of all-time! Often times called “Double Diffraction”. These frames actually feature about 30% more light grating than our Standard series and come in a variety of frame colors from black to neon and glow in the dark. Also available in tinted and auburn enhanced lenses to amplify your experience even more. The name “Ultimate” stems from their virtually indestructible frame and lenses. Flip Ups & Matrix: This variety of Flip Frame glasses all feature 3D or light grating lenses, or a combination of both. These are what we consider quadruple diffraction or our “Flip-FX” series. Some feature different effects such as spiral diffraction, matrix, or 3Diffraction(3D+light grating). The high quality makes these arguably the best option. These trippy glasses take your experience to the next level. Specialty & Limited Edition: This category of glasses generally features our same Ultimate lens in an array of cool frames such as foldable diffraction glasses, heart frames, kitty cat frames, and more! 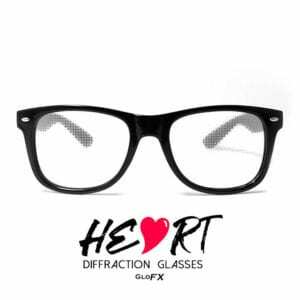 Some also utilize spiral diffraction or other special effects lenses such as heart diffraction glasses. Our Limited Edition (LE) frames are exclusive designs that you cannot find anywhere else. These rave glasses will make you stand out. Most are only produced in limited numbers and made from the most superior craftsmanship. Paper Cardboard: These custom manufactured paper diffraction glasses are a low cost version of hard plastic rave glasses. These feature the GloFX double effect, the same found in the ultimate series. Excellent for buying in bulk for all of your friends, a birthday party, or promotional use! Diffraction Monocle Necklaces: These utilize the same lenses, but are fashioned into a necklace. This also doubles as a great 3D Diffraction Camera Lens. Our monocles are forged from 60/61 aluminum and stylized in several color options to fit your style. Or, build your own customizable diffraction glasses. In addition, we manufacture all of our shades and offer wholesalers OEM manufacturing. Meaning that in bulk you can customize, custom print, and buy custom branded wholesale diffraction glasses. Most users would be surprised by how a little care and maintenance can keep your favorite pair of diffraction glasses working flawlessly from festival to festival. One thing to keep in mind is the protection of your lenses, and this is why at GloFX we like to supply our customers with a stylish yet functional micro fiber carrying case. This case is the perfect add on to create a safe storage place and dual functionality for cleaning your glasses. Here are a few basic guidelines to keep your diffraction glasses looking brand new! Avoid contact with any oily substances. Use only plain water and cotton or microfiber cloths to clean your lenses. Store your glasses in a cloth pouch or case when not in use to avoid contact with dirt and debris. Store your glasses in a cool, dry place. You might be asking yourself why is it such a big deal to avoid oily and acidic substances when cleaning your diffraction lenses. The answer lies in the physics behind diffraction glasses. Remember that your glasses give off such awesome visual sensations due to the microscopic laser etched slits within the lenses. Water has no problem cleaning and wiping free from these slits, but oils and acidic substances have the tendency to fill in the microscopic slits and is nearly impossible to fully remove. This can cause your diffraction effects to be greatly diminished and even obsolete, what a bummer! So remember, always care for your diffraction glasses by simply cleaning them with water and a micro fiber cloth to keep your visual effects top notch! 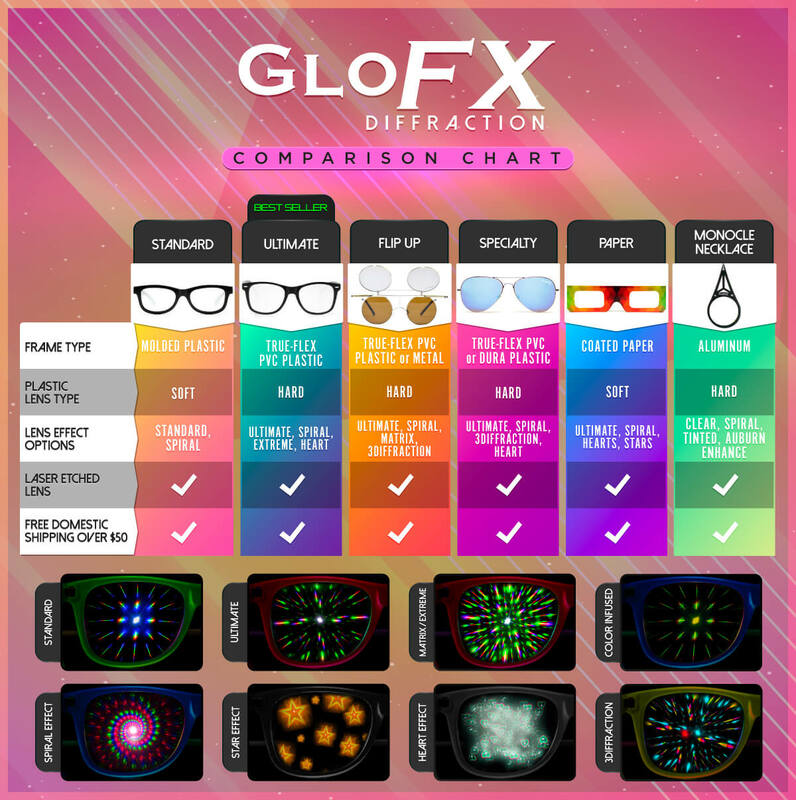 We are proud to offer a Lifetime Limited Warranty on all GloFX Diffraction Glasses with the small exception of our Luminescence or Paper Series. At GloFX, we have spent years building and developing a reputation for quality. We stand behind our products’ workmanship and quality. If you experience a manufacturer’s defect in materials, GloFX will warrant your glasses for the lifetime of your product. We also guarantee that you will have a pleasant shopping experience and back all products with our GloFX 100% Satisfaction Guarantee. Now that you are an expert in all things diffraction, it should be more than clear why GloFX is the best option. But if it’s not, keep reading. There are many companies that sell diffraction glasses, but at GloFX we take pride in our passion for diffraction and LED eyewear. Since 2009, our team has engineered and developed dimensional eyewear for entertainment purposes along with hundreds of other LED & Glow products, GloFX has led the industry since it’s start, first introducing a pair of hard frame laser etched diffraction glasses in 2009. Every year since, more and more frames and lenses been released from GloFX. Since 2012, GloFX has been in high gear releasing multiple new models every month. Now offering the largest selection of diffraction frames and lenses available on the market, it should be obvious GloFX has the edge. Quality and craftsmanship are prime components of GloFX Glasses, along with renowned effects and styles you cannot find anywhere else. On top of that, we also offer an industry leading Lifetime Limited Warranty also backed with our GloFX 100% Satisfaction Guarantee. It’s doesn’t stop there, GloFX ships all orders within 24 hours, offers remarkable customer service, and holds the largest inventory to ensure your choice product is in stock.